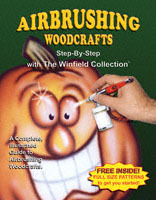 This is an illustrated guide to airbrushing and has all kinds of useful information on getting started with airbrushing. Includes five patterns: Patriotic Heart Hanger Pattern, Patriotic Candle Holder, Rose Sconce Pattern, Sun Wall Hanging Pattern and Smiling Pumpkin Door Sign. Also included are instructions for making a Pofessional Airbursh Easel.